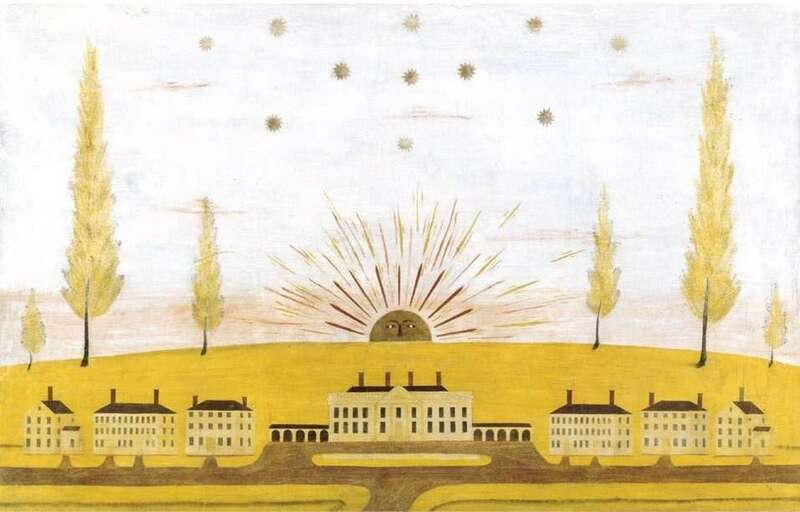 Rufus Porter left his mark on early New England homes with stencils on their walls and Scientific American on the coffee table. He was a classic Yankee of the early 19th century, part peddler, part itinerant artist. A descendant of early Puritan settlers, he took to the road selling what people would buy at the time. He also founded Scientific American, invented the revolving rifle, and wrote a popular How-To book for artists. Rufus Porter liked coming up with new ways to do things. As for getting patents and making money from his ideas, well, not so much. 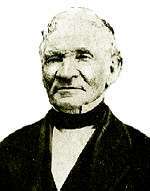 He was born in West Boxford, Mass., on May 1, 1792. Two of his ancestors, John Porter and his wife Mary, immigrated from England during the Great Migration of Puritans. When he died, he owned property that included the Massachusetts cities and towns of Salem, Danvers, Wenham, Beverly, Topsfield and Boxford. His parents, Abigail and Tyler Porter, just had a farm, which they sold when Rufus was 9 and moved to Maine. At 15, he became apprenticed to a shoemaker. The shoemaking apparently didn't take. He played the fife and fiddle for several years in Portland, enlisted in the militia during the War of 1812 and then painted drums and sleights. Rufus Porter married Eunice Twombly in 1815 and started a dancing school the next year in New Haven. But by then he must have sensed a new American craze: portraits. To have someone paint your own, that is. Rufus Porter took to the road and began painting people's portraits, in some ways a typical itinerant artist. In other ways he wasn’t. He figured out how to quickly paint likenesses with a portable camera obscura: a dark box with a lens and a mirror that threw the sitters' image onto a piece of paper. He’d come to town with his nephew Jonathan D. Poor and a camera obscura mounted on a cart decorated with flags. He could paint a silhouette in 15 minutes and charged 20 cents. Sometimes he’d paint 20 portraits a day. 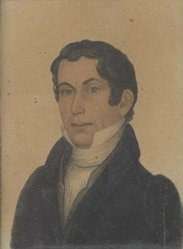 He painted one famous likeness of Timothy Fuller, a Massachusetts congressman and Margaret Fuller’s father. Somehow Rufus Porter managed to have 10 children despite all the time he spent on the road. He had six more with his second wife, though only one survived infancy. Later, he came up with a formula for quickly painting murals and stencils on the walls of farmhouses and village taverns. He shared his wealth of knowledge with a How-To book, called A Select Collection of Valuable and Curious Arts, and Interesting Experiments. It went through four printings. It was quite the thing to stencil your walls in 1829, the year a commenter wrote, "You can hardly open the door of a best room anywhere, without surprizing or being surprized by the picture of somebody plastered to the wall and staring at you with both eyes and a bunch of flowers." For a while he traveled with Moses Eaton, Jr., and together they decorated the interior of the Hancock Inn. He also painted murals on the walls of the Kent House in Lyme, N.H., the Birchwood Inn in Temple, N.H., the Damon Tavern in North Reading, Mass., and the Mural House in Green, Maine– to name a few. Rufus Porter painted at least 160 murals on the walls of houses and taverns. He traveled to the mid-Atlantic, all the way to Virginia. A Rufus Porter mural now at the Renwick Gallery in Washington, D.C.
During his abnormally busy career, Rufus Porter started Scientific American in 1845. 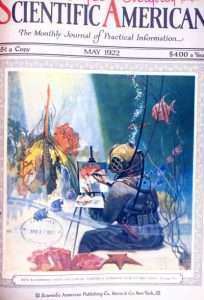 He sold it 10 months later, but stayed on as editor for another 18 months. He also contributed articles to the magazine for the rest of his life. Rufus Porter invented many new things during his remarkable career, including clocks, railway signals, churns, a life preserver, a cheese press, and a revolving rifle. He patented only a fraction of his inventions, and sold the rights to his rifle to Samuel Colt for $100. His real obsession, though, was building an airship. In 1849 he conceived of a dirigible that would take prospectors to California during the Gold Rush. Powered by steam, it would be 800 feet long and carry as many as 100 passengers. Rufus Porter had already demonstrated scale models of his airship. He had such confidence in his invention that he asked for down payments of $50 for a $200 New York-to California fare on his aerial locomotive. A tornado destroyed his first airship, rowdy onlookers destroyed his second, and technical troubles tanked the third. Rufus Porter died on Aug. 13, 1884, while visiting his son in West Haven, Conn.
People still paint in the style of Rufus Porter. You can visit the Rufus Porter Museum in Bridgton, Maine.